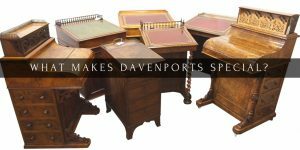 Home / News / Antique Davenports: The Perfect Desk For The Modern Home? The term ‘davenport’ is first noted in Gillows’ Cost Books in the 1790s. Gillows were a prosperous cabinetmaking firm operating out of Lancaster and London from the 1730s to the 1840s. The term appeared in the phrase ‘Captain Davenport, a desk’ next to a design of it. This became one of their most famous inventions. The Gillows company records consist of journals, day books, waste books, bill books, cash books, ledgers and more. They date from 1731-1986 and are currently housed in The City of Westminster Archives Centre. The Gillows archive is an important piece of history, as it is the most complete set of records for any British furnituremaking firm. We aim to always have a selection of Gillows, or Gillows style, furniture in stock. 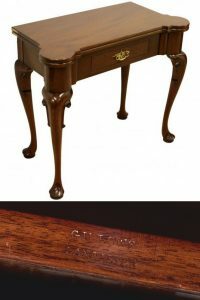 If in doubt, try looking for the Gillows makers label – as you’ll see, you can find one stamped to the drawer of this George II Style Mahogany Card Table. The firm began using the ‘Gillows Lancaster’ stamp after 1780. Some key characteristics of davenports include a gallery around the top, leading on to a sloping lid, most often opening up to reveal a storage space. Some davenports are also fitted with a spring-loaded section to the top and a combination of drawers to the sides (both real and dummy drawers). Many furniture makers became more inventive with davenport designs over time, with pull out fronts, rotating top sections, and decorative inlaid patterns. They also expanded it from being a contained, rectangular unit, to adding cabriole legs and pedestal bases. There are several examples of davenports found in museum collections worldwide, including this Victorian davenport desk, circa 1840, in satinwood and with marquetry panels (Shrewsbury Museums Service). Although at one stage very collectable, they’ve recently been over-shadowed by writing tables, and partners desks. However, davenports have a distinct advantage: their size. Compact, and offering plenty of hidden storage, they are a brilliant alternative for homes that are short on space. The variety of davenports available also show the creativity of Regency cabinetmakers and their successors. In our warehouse we have focused on acquiring davenports that are made in quality materials and are in excellent condition. You can see more of these here. 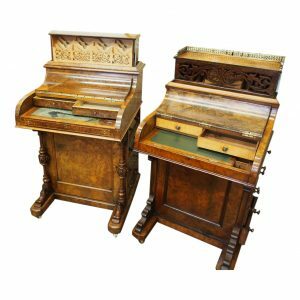 Whilst some davenports have a sloping lid with the writing surface to the top (often in leather), other furnituremakers excelled at creating piano top davenport desks. 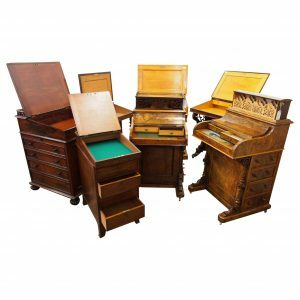 Named after the curved shape and form of pianos, they will usually have a hinged lid which opens up to reveal a series of compartments and a retractable writing slide. We have a couple piano top examples currently available, including these two mid-Victorian burr walnut davenports. Both have the benefit of hidden storage underneath their curved lid, with drawers and compartments for pens and antique inkwells – or quills if you are really inclined! To open their ‘jack in the box’ section in the top you only need to pull forward a small button in the writing drawer (inside the hinged lid). Rosewood timber is native to Brazil, Honduras, Jamaica and India, and due to the slow growth rate of these trees is a prized material, and distinguishes quality furniture. During the Regency period it was exported to the United Kingdom from Brazil, Jamaica and Honduras, and whilst it has a characteristic dark brown colour with streaks and grains it can be hard to manipulate and work (it has a high oil content). We have almost every type of furniture in rosewood in our warehouse – from large William and Mary period Indo-Dutch cabinets, to bookcases, chiffoniers and breakfast tables. One notable example is this William IV rosewood davenport, which also has a three quarter gallery in rosewood as well as the main body. At only 64 cm deep when closed, the top can then slide forward to allow for it to be more like a desk – floating over the knees of the person sitting at it. This davenport also features the stamp of ‘M. Willson, 68 Great Queen Street’ to one of its drawers. This is the stamp of Mary and Matthew Willson, the wife and son of Thomas Willson who was a furniture broker and appraiser in London (operating 1799-1854). You can see more of this davenport here. If you’ve visited our warehouse you’ll know that this is only a small offering of the variety of davenport desks that we have available. These distinctive, quality items of furniture would be a brilliant addition to any home office, or for someone looking for a unique place to use and store their iPad, laptop or Kindle Fire. Because who said that new technologies and antiques can’t mix?